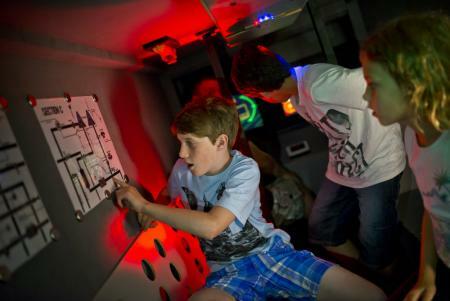 Puzzle rooms or escape games offer immersive, heart-racingly exciting family fun. Whether your role is to complete a quest, get out of a locked room or retrieve a lost object there will be code-breaking, puzzle-solving and probably a bit of spycraft to keep you busy. From Edinburgh to Cornwall, we tested out some of the best puzzle room options for UK families. "The battle cruiser UNS Steadfast had fallen into enemy hands and a nuclear missle launch was imminent. Our mission: to stop the launch in time by solving clues and moving from room to room in the cruiser without being detected. We chose to accept and had a rollercoaster of a ride completing physical tasks (crawling through tight spaces was a little tricky for the adults! ), solving puzzles, shooting lasers and sliding down chutes. "The sets were fantastic and very atmospheric, complete with buttons, control panels, safes to open, laser obstacle courses and escape hatches. The mission was hard enough to be a challenge for the kids, but simple enough for everyone to be involved in the solution, whether aged 6 or 40+! Si5 SpyMissions is an excellent introduction to puzzle rooms for a family, as there are missions aimed at younger kids (Malice's Revenge for those aged 6 to 7) as well as general family groups (Shadow Force for 8+ years) and "big kids" (Covert Sword); most puzzle rooms are aimed at over 10s only. Their birthday party missions are very popular, but a family adventure is a great way to get the grown-ups involved, too (you don't get many opportunities to slide through a tunnel on a trolley as an adult!). Fantastic fun." Elena Dalrymple went to Si5 SpyMissions Croydon with her husband Will and their children Kate, Tom and Emily. Si5 SpyMissions is in Cambridge, Milton Keynes, Walthamstow, Nottingham and Croydon. Prices start at £9 per person and kids' birthday party packages are available. "Will you be the one to save the wizarding world, or destroy it? Assemble your Order and choose your quest at the Department of Magic, a boy wizard-inspired escape room puzzle right next to Edinburgh’s historic Royal Mile. "After descending the ivy-covered steps and opening the mysterious sacking-masked door, we first walked into the cosy and welcoming Magic Potions Tavern – filled with wooden tables, candelabras, board games and numerous strange-looking magical artefacts. After sampling some delicious butterbeer and chocolate frogs and having a go at a fun warm-up puzzle, we donned our wizard robes and discovered our team trait (wisdom, obviously), before finally walking through the ‘wall’ to discover the mysteries lurking behind it. "The quest facing us, the mighty Order of Midnight, was to collect the prophecies stolen by the Dark Lord and save the wizarding world from destruction – and we had a mere 50 minutes to do it! Adventuring our way through three dimly-lit and atmospheric chambers, we had to solve a series of tricky interconnected puzzles which played to all our different ages, strengths and skills including some skilful potion mixing (involving owl feathers), dramatic spell casting (thanks to a working wand) and cunning code breaking (with the help of a purring dragon!). It was a close-run thing, but with a few handy hints from our Games Master, we managed to defeat the Dark Lord with a magical sword and escape with only 4 minutes to spare (phew!). 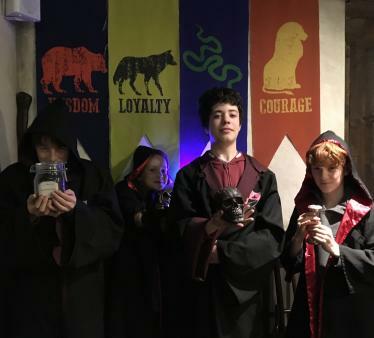 "Whether you’re a Harry Potter lover or not, this unusual escape room was great fun for both adults and children aged 10+, with plenty of lateral thinking, problem-solving and dragon-charming skills needed!" Heather Walton visited the Department of Magic in Edinburgh with son Tom, daughter Ivy and friends Archie and Frank. Department of Magic games are suitable for 2-5 players. Prices start at £40 for a team of two and booking is essential. For ages 10+. "On a wet autumn day we left twenty-first-century London behind and stepped into the past, walking through a doorway into a World War II Prisoner of War camp in Germany. Armed only with the journal of a previous escapee, the legendary Bob Hails, we had 60 minutes to make our bid for freedom, and every item in the barracks room we found ourselves in could be the answer to escaping. There were clues to find, codes to crack and calculations to be made – and the guards made their presence felt outside the door! "With the clock ticking, we each tackled a different puzzle, working together as a team to pool our knowledge. Escape room experiences can be a little frightening for younger children (and most won't let under-10s participate), but The Adventure Begins was the perfect introduction for my eight-year-old: the game rules were easy to understand, the atmosphere was exciting but not intimidating and she was able to help gather lots of clues and feel part of the code-cracking team alongside her older brother and sister. We all loved the set, which is brilliantly designed to make you feel you have actually been transported to the 1940s (good links to the KS2 history curriculum, too! ), and found the puzzles challenging but not impossible – we made it out in 48 minutes! It was fantastic to watch the kids' quick thinking under pressure, and their collaboration and team spirit was a real highlight of the experience. "All three of them loved every second of it, immediately asking to complete the second Escape Plan adventure (The Battle for Britain, also set in WWII) as soon as possible! After a final debrief from our double-agent guide and a team photograph, we were back in England, close enough to Brick Lane to make the most of the fantastic food and hot chocolate options while reviewing our favourite puzzles and clues from the room. Brilliant family fun!" Elena Dalrymple escaped from a WWII POW camp with her husband and three children, aged 8 to 15. Escape Plan offers two different team games for groups of 2-7 players aged 9+ in London; tickets start at £89 for 7 players and booking is essential. "Tucked behind the Royal Mile, in the centre of Edinburgh's Old Town, Can You Escape? 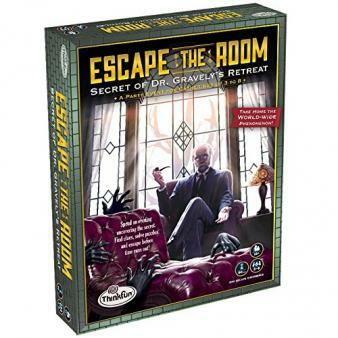 offers two different locked room games, the spy-themed Operation Deadlock and the more family-friendly Operation Odyssey which is what we went for. "After an entertaining briefing from Commander Hyde, our intrepid bunch of space agents blasted off on a 60-minute mission to fix the escape pod and flee the space station before being hit by a meteor shower. Getting into the futuristic pod via some nifty work with a pair of secateurs and a magnet, we moved onto more multi-layered problem-solving, all while make sure the lights didn't cut out and plunge us into darkness. Escape game novices, our initial 'headless chicken' strategy improved as we started communicating as a team, with each member figuring out different aspects of the puzzles in front of us – reflecting light rays, working a robot buggy, cracking codes, colours and constellations and even remembering some 60s song lyrics. Thanks to top teamwork and a couple of well-timed hints from the onboard computer, we made it out with five minutes to spare, exhilarated at our success and desperate to have a go at another one! Great fun for children (9+) and adults alike, the whole experience tested teamwork, lateral thinking and problem-solving skills and was helped by a very able games-master who provided just the right level of assistance (and bad jokes) for everyone to thoroughly enjoy themselves." Heather Walton visited Can You Escape? in Edinburgh with her husband, Stuart, son Tom, 12, friend Archie, 12 and daughter Ivy, 9. Can You Escape? is in Edinburgh and York. Prices start at £12.50 per person and booking is essential. For ages 9+. 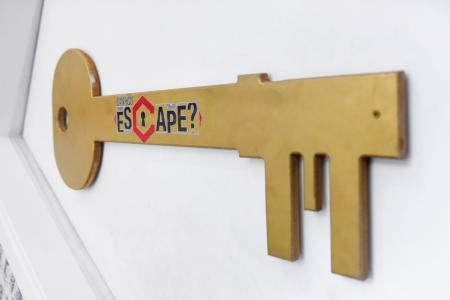 A comprehensive list of escape rooms and puzzle hunts in the UK is available on the Exit Game website; there are rooms in over 240 venues, all over the country. Puzzle rooms are themed in lots of different ways and some of them are definitely frightening and adults-only, so make sure you check age restrictions before you book. 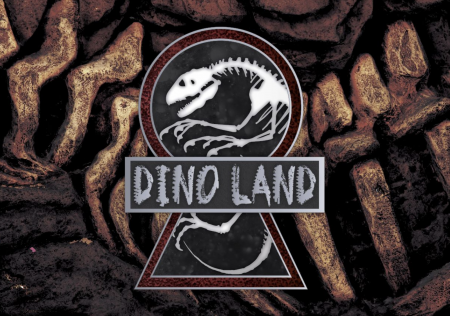 "On your first day as an employee at Dino Land you wouldn't expect to have to run for your life to escape from terrifying giant reptiles, dodge obstacles and solve puzzles by torchlight – but that's all part of the escape room experience! "The Panic Room is the UK's largest escape room venue, with an amazing 15 different experiences to choose from. From horror rooms (not for visiting with the family!) to detective stories, murder mysteries and a Wizard-of-Oz or Pocahontas-themed experience, there are loads of options to choose from for an hour of action- and puzzle-packed fun (there's even a mini escape room for a taster session and a mobile escape room if you prefer the puzzling to come to you!). We loved the scene-setting and scope of our dinosaur adventure: there are multiple sections to explore and search, with challenges that both adults and kids found tricky (but satisfying). The atmosphere was tense but not scary, perfectly pitched for older-primary children. A thoroughly enjoyable afternoon for the whole group." Elena Dalrymple went to Dino Land with a friend and their children, aged from 8 to 15. The Panic Room is in Gravesend, Kent (different rooms are also available at The Panic Room Harlow, in Essex). Prices start at £25 per person and most of the escape room experiences are suitable from age 8+. Can't get to a puzzle room in person? Make your own escape room experience at home with a pre-prepared game in a box, designed to be completed by a small group of people in a few hours. 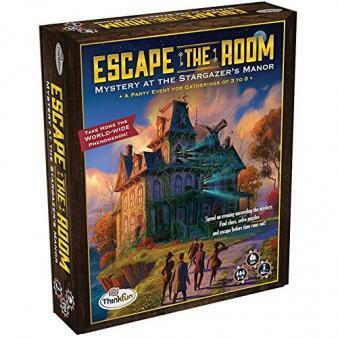 We love ThinkFun's options, Escape The Room - Stargazer's Manor and Escape The Room - Dr Gravely's Retreat.